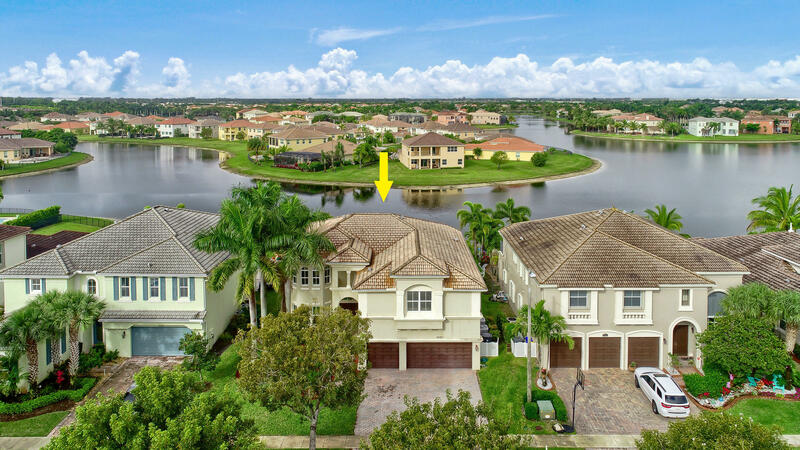 Stunning highly sought after lakefront Sienna Grande model in the prestigious estate section of Cooper Village inside Wellingtons premier resort community Olympia. A rated number one schools! Main floor bedroom and full bathroom. Entire home equipped with hurricane impact resistant windows and doors, that is over a 100K upgrade! Gorgeous huge porcelain tile with zero grout lines, hardwood floors, and a fabulous wrought iron jaw dropping staircase greet you upon entry. Kitchen is stunning and tasteful with huge walk in pantry, Thermador appliances and range hood venting outside, and granite countertops with glass tile backsplash. California closets, glass shower doors, high efficiency Tito toilet systems, tankless water heaters, gutters throughout, and 2011 high efficiency ACs.